This was painted from a photo I took along the Maine coast. I love the weaving design, and the many layers of atmospheric distance. 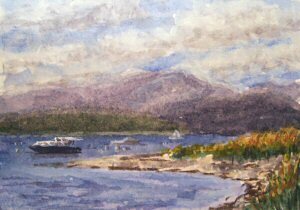 I’ll still me doing my more traditional work in acrylics and other mediums, so I’m not ready to give up that style yet! But I’ve been enjoying the exploration of this style over the past year or so and plan to do more of it. So, what do I think of the new Golden High Flow acrylics? Well, here’s my personal opinion of the good, the bad, and the beautiful. 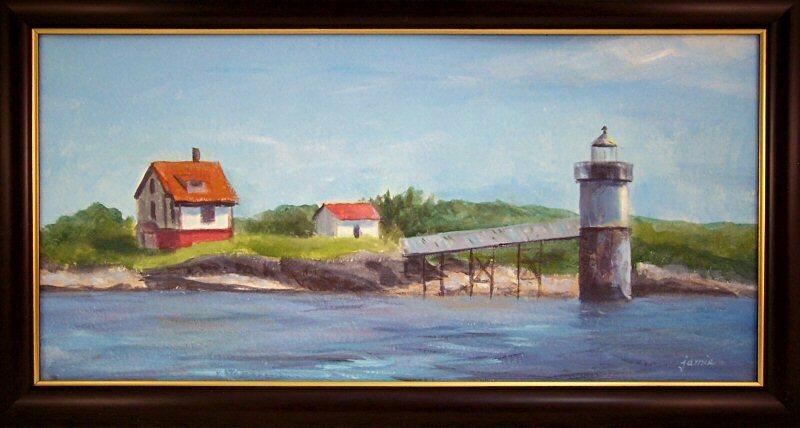 I’ve been working with them for awhile now and have had a chance to do several paintings. I also had the advantage of working with the Golden Airbrush paints for a year or so previously. They are the predecessors to the High Flow line, so I had an idea of how they would handle. Sort of. 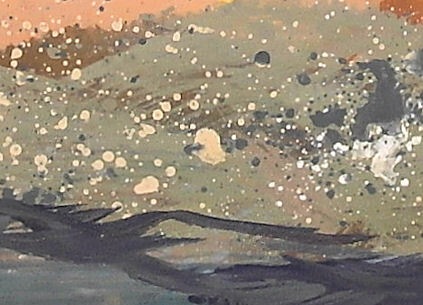 These paints handle similarly to the Airbrush paints, but not exactly the same. The good news is that the High Flow line has a more robust, durable binder. The bad news is that the High Flow line has a more robust, durable binder. It’s funny how that can happen! In the long run, I think this will prove to be a good thing for me. It really does make the paints more archival, and they will be easier to varnish. In the short term, I have some technical things to work out to adjust for the difference, since the paint will not lift as easily nor for as long. The colors are exquisite. I missed a lot of my favorite colors in the old line, but the High Flow line has Ultramarine Blue, Pyrrole Orange, some real earth colors, and other colors that I like a lot. I do wish there was a Pyrrole Red instead of Napthol. I’m using Quinacridone Red mixed with Pyrrole Orange instead. I’m sure that more colors will come along over time, as I can’t imagine this not becoming a very popular line. 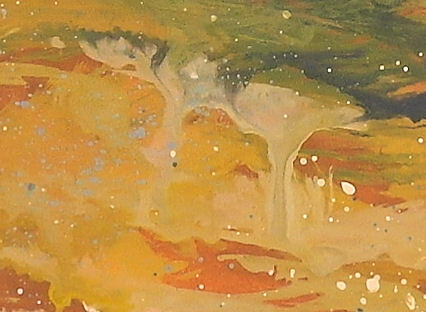 The good news for collectors is that these paints dry to a durable finish. They varnish beautifully and can be framed without glass, just like other acrylics and oil paintings. I remember so well the vividness of the sunset on the night I took the photo for this painting. We were returning from a sunset cruise on one of those perfect Maine evenings. This painting is 3×4.5″, and is hinge-mounted to a backing board, and double matted to 5×7″. The backing board and double mat are included in the price within the US. The photo makes the mat appear a little grey, but it is actually an ivory colored outer mat. In case you think you’re having a deja vu moment, yes, you’ve seen this before! 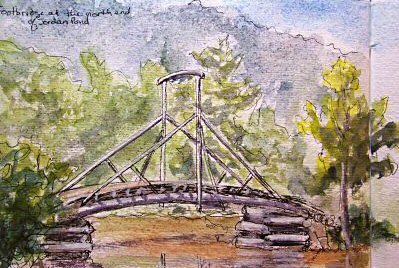 I painted it a couple of days ago and posted it, but as I looked at it on the drying rails over the past few days, it didn’t quite look done to me. 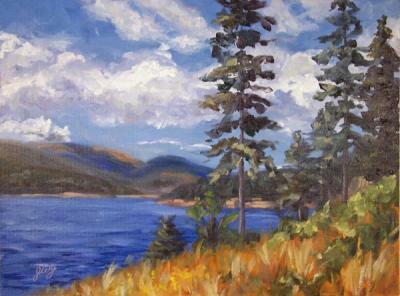 So, I made a few changes and additions, and I’m now posting the new version of the painting. This little inlet, weaving out to the islands and ocean from Mt. 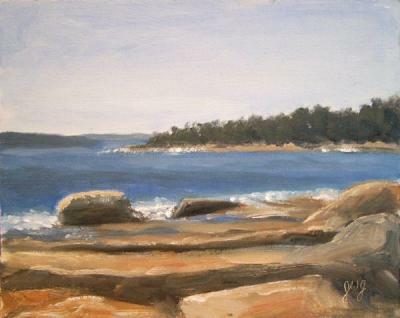 Desert Island, was a favorite spot on our last trip to Maine. My husband and I took oodles of photos there, and I’ve been wanting to paint from them ever since! My plan is to do a couple of large paintings. 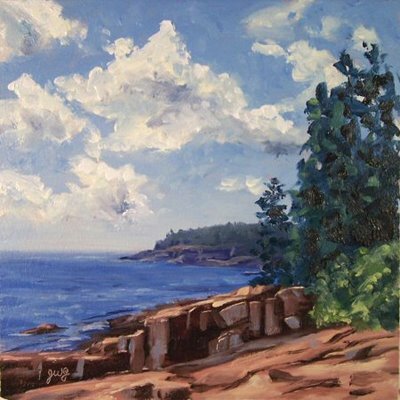 I enjoy starting that process off with small color studies to help me determine which compositions are most worthy of enlarging, and make some decisions regarding what I will change from the photo and what I’ll keep the same. $185.00 plus $20 shipping and insurance within the Continental United States. For local sales, shipping charge will be allocated to NYS Sales Tax. Please email me at JamieWG@aol.com for International purchases or with any questions. 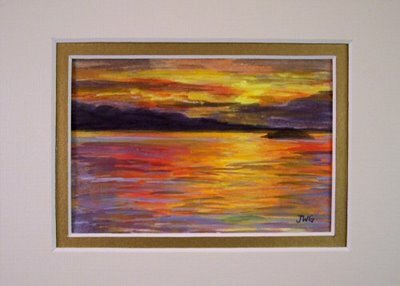 I don’t often offer framed art on my website, but I found these long format frames and thought they’d be great for smaller landscapes horizontally, and floral still lifes vertically! 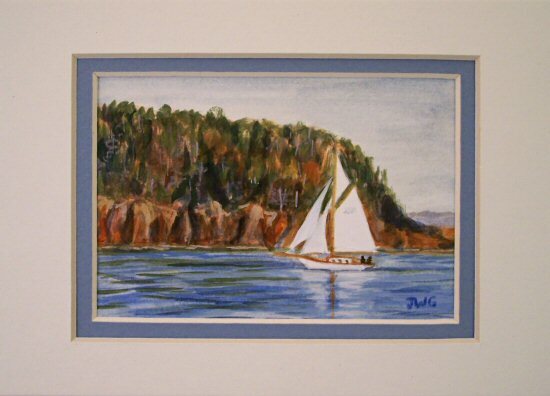 This painting was done from a photo I took on my way to Monhegan Island by boat. 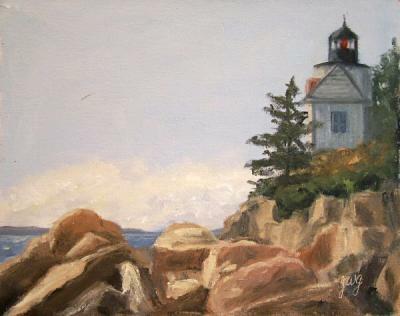 Ram Island Light is close to Boothbay Harbor in Maine. Both the keeper’s house and the lighthouse were built in 1883. I’ve been wanting to paint them for ages! 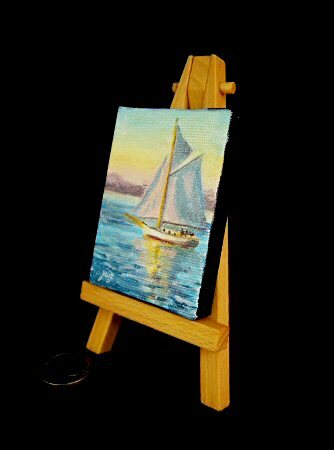 I saw these tiny stretched canvases in an art supply store. They were just too cute to resist! 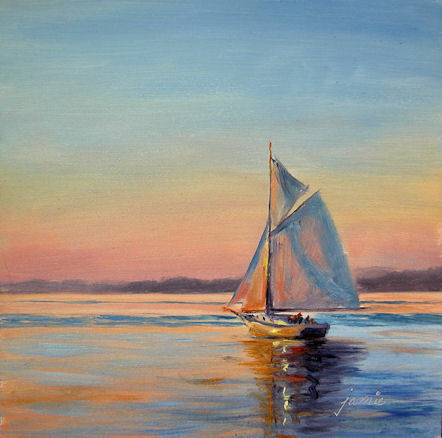 I painted this sailboat and sunset from a photo I took when I was up in Bar Harbor, Maine. 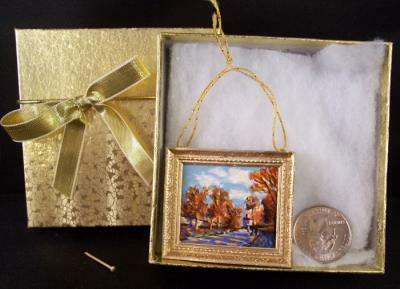 The painting will be shipped to you in a gold gift box, and with the mini easel. The nickel is there for size reference so you can see how tiny it is! This would make a perfect gift for your favorite sailor, or anybody who loves Bar Harbor and Maine as much as I do! Here’s another image of it from the sides, so you can see the depth of the stretchers. I painted the sides with black acrylic. It looks really sharp! 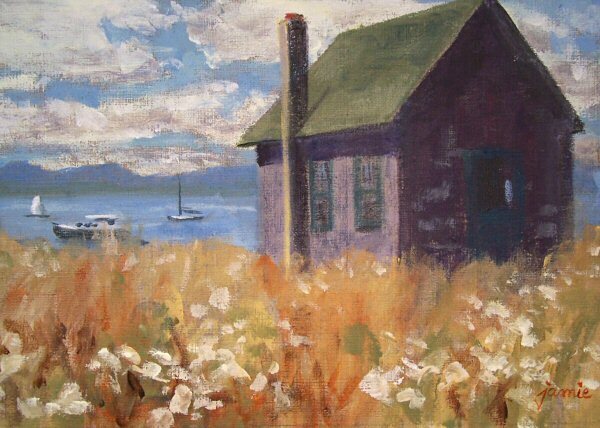 I have such fond memories of painting here behind the Jordan Pond house during summer vacations. 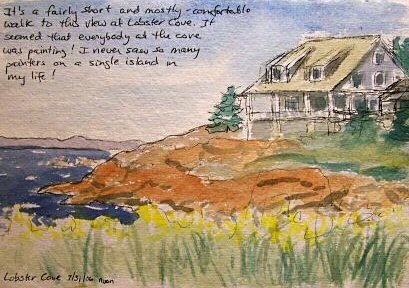 This past summer was the first time in many years that we did not get up to Bar Harbor and Acadia National Park, on Mount Dessert Island. I missed it a lot. 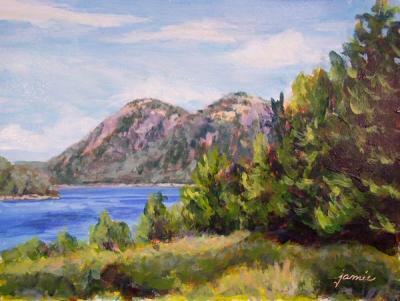 Since I couldn’t paint there this summer, I decided to pull out some photos today to paint the beautiful Bubble mountains overlooking Jordan Pond. 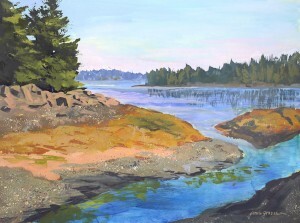 This painting is done from a photo I took on an expedition to Little Cranberry Island off the coast of Maine. This weathered Maine boathouse was right on the shore of the bay. I’ve been wanting to paint this scene for a long time, and may do a larger version as well at some point. 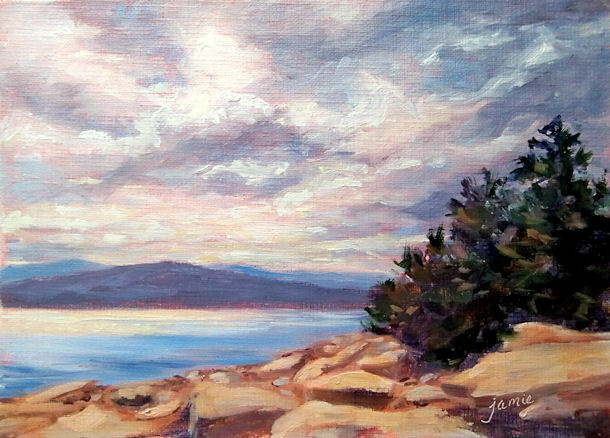 If you haven’t yet begun a collection of “Jamie’s Jewels”, this is a perfect one to start you off in style! Remember too that Mother’s Day is coming. This would make an ideal gift and arrives in a little gold box. 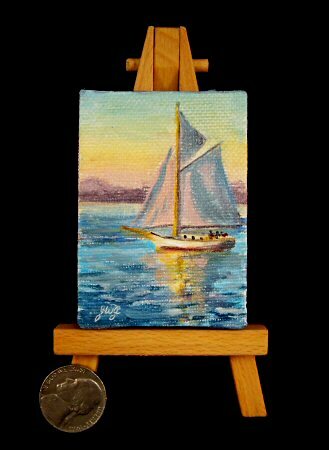 This one is slightly larger than my other recent micro paintings, by about 1/4″ (hence the slightly higher price tag). 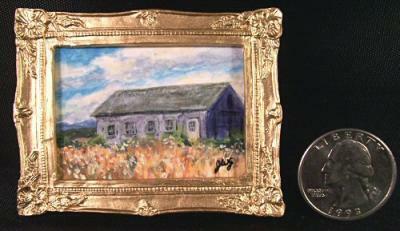 These micro paintings make a great collection when hung as a group! When we were in Maine last summer, we went for a sunset sail on the four-masted schooner Margaret Todd. We lucked out with a spectacular sunset. 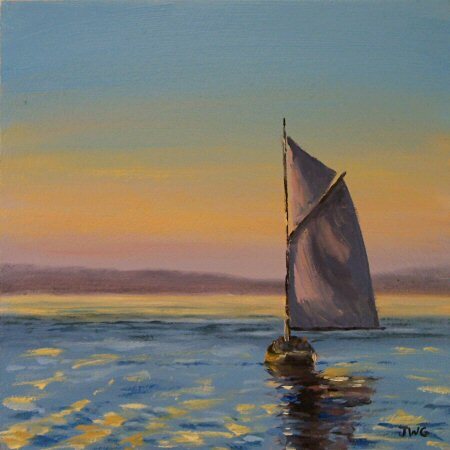 I took oodles of photos, including the one of this boat sailing nearby. Every time he tacked, the light would catch the sails from a different direction. I was so glad to have my camera along! 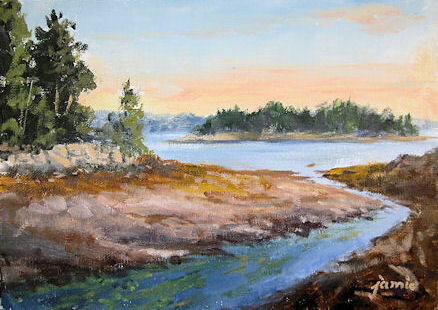 I got up extra early to finish the painting this morning. I’m going to be offline for a few days after this post, but I’ll see y’all back here on Tuesday. 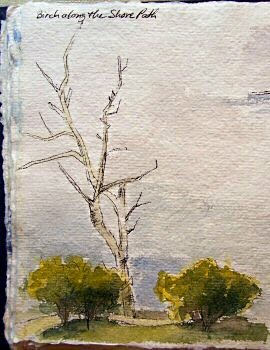 This is a miniature (2.5×3.5″), gouache on 100% rag watercolor paper, unframed. 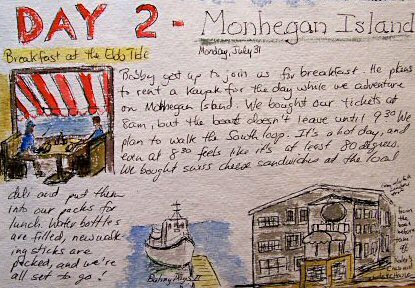 It is a scene from a photo I took while visiting Little Cranberry Island for a day, off the coast of Maine. 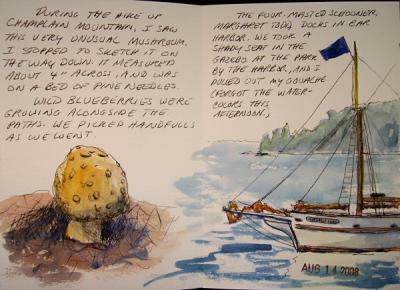 This past summer, our hotel room in Bar Harbor faced the Porcupine Islands. 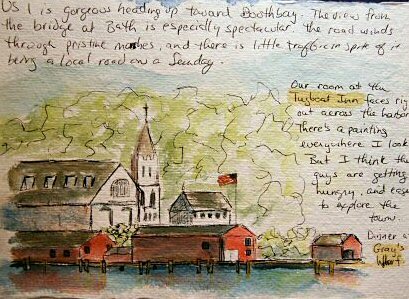 We’d watch the boats sailing in and out of the harbor. 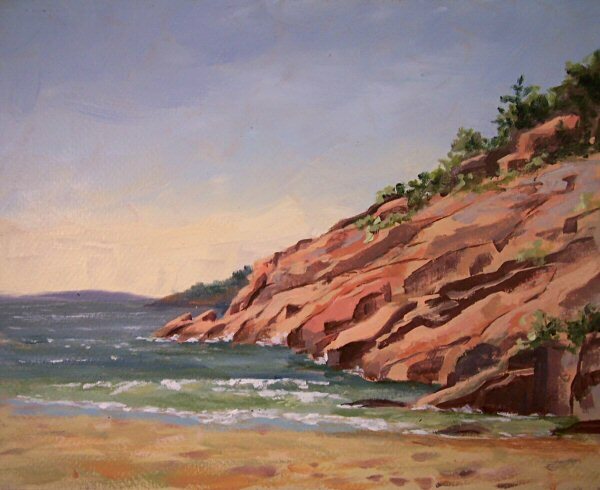 This painting was done from one of the photos I took there. The painting itself is 3×4.5″. 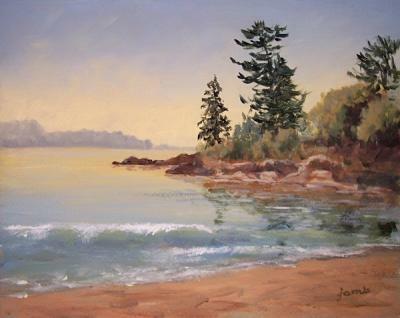 It is mounted to a backing board, beautifully double-matted to 5×7″, and framed.